The majority of users just love the full-length Boost cushioning of the Crazy Explosive 2017 Primeknit. It’s responsive, and it offers good impact protection. The same can be said of the Harden Vol 3. A lot of buyers are pleased with how comfortable these Adidas basketball shoes feel. Most testers reported that the Crazy Explosive 2017 PK has excellent traction. The shoes have great ankle support, a good number say. Many note that the shoes look amazing. Overall fit is amazing, according to most. There are no empty spaces in the shoe. 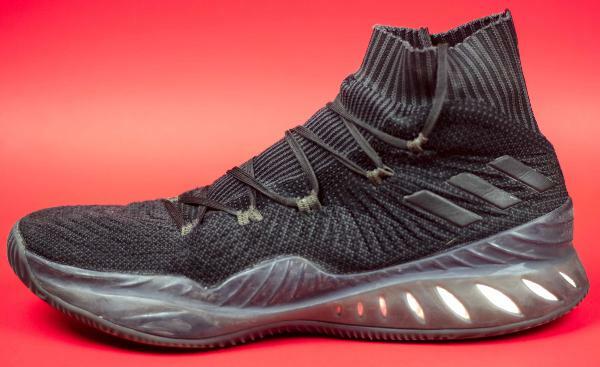 Nearly all reviewers claim that so far, the Adidas Crazy Explosive 2017 Primeknit is the best performance sneaker of 2017. The majority of wearers report that the Adidas Crazy Explosive 2017 PK runs narrow. Wide-footers are advised going up half a size. A good number of buyers find the shoes a little stiff and hard to put on. Like the AJ 33, some are reporting that the outsole of the Crazy Explosive 2017 Primeknit wears out quickly. This is usually the case for basketball shoes with translucent outsoles. A few users reported that these Adidas shoes take a little time to break in. These Adidas shoes are not breathable, a handful commented. The Adidas Crazy Explosive 2017 Primeknit is arguably one of the best basketball shoes of 2017. It’s versatile and highly recommended for any type of player and position. Responsive Boost cushioning, great impact protection, bouncy ride, killer traction, and solid foot containment. This is one shoe that does everything and does it well. The Adidas Crazy Explosive turns out to be one my sister's favorite shoes to play in. So when she said I needed to play in these, I was hesitant to take her seriously. But I'm so glad that I did! The original release caught my eye in 2016. Dubbed the "Andrew Wiggins", the shoe was quickly sold out everywhere, especially the black prime knit colorway. She played her senior year in the 2016 black colorway with the glow-in-the-dark accents. And after the press release for the 2017 Adidas Crazy Explosive surfaced and I saw the pictures, I had to give the nod. These were my first pair of Adidas I ever wore playing competitively and they definitely gave me an advantage. The traction of the Adidas Crazy Explosive 2017 is one of my favorites, especially coupled with the Boost, which I will discuss later. The pattern, composition, and profile have proven to be one of the best. The amphibious pattern on the bottom has a rubber and synthetic feel. The only downside is the durability of this sole. I don't play outside too often and don't think these will last playing outside. I can only vouch for playing inside on wood floors. When I look at the bottom of the shoe, I can identify where I make contact the most with my shoes. The stop and go is an essential feature of the shoe; just be cognizant that they will not last forever if you don't rotate them. I was very excited to try one of the first shoes with the weaved upper from Adidas aka Prime Knit especially after having a great experience with other brands that have adopted this type of technology for the upper. Adidas is different in that some areas are strategically reinforced with a ribbing in the weave. The finished product offers a fit with great feel in the toe and sides of the foot. The Adidas Crazy Explosive '17 offers a lighter feel on-foot than most shoes I tried when these were released. I judge the weight of a shoe most the time based off of how I feel making my first and second step on a move out of triple threat. I've held this pair and the Adidas Crazy Explosive '16 in hand and while I did not use a scale, I could tell the prime knit is definitely lighter. I love prime knit shoes by Adidas. Combined with the outsole and midsole, the Crazy Explosive proved to be revolutionary for a period of time when I played in these. Prime knit provides an awesome fit, breathability and a light feel. My issue with the Crazy Explosive is the durability. The shoestring eyelets tore off eventually and the inside of the upper has excessive wear. I assume the wear is from moves where I plant with the inside of my foot but yeah, they really do start to break down after playing hard in them. Adidas boost cushion is revolutionary. One of the most memorable feelings is when you FIRST put the shoe on and walk around in it. And this pair had me smiling and saying "these feel really good." No exaggeration. For me, there is nothing they could have done better with the cushion of this shoe. Another newer trend in basketball shoes that Adidas Crazy Explosive '17 has is the sock-like feel around the ankle. The primary portion of the upper actually comes up to my ankle, versus stopping right below it. So when laced, it really does provide a snug and structured feel. The midsole also has areas of support around the sides of the foot that prevent your foot from feeling like it's slipping inside the shoe. Highly recommended despite the tendency to show wear early! Keep in mind what level of player you are when making a decision based off of my reviews. Are you a casual player or do you play 100+ games a season? You do not want to miss out on playing in the Adidas Crazy Explosive '17 especially since they are likely available for some good deals in 2018 compared to being offered for $149 when they were initially released. Crazy good performer, looks dope, good price, premium materials, can't go wrong and cop a pair. This shoe is probably the best shoe I've ever worn. Improved fit and killer cushioning should put the Crazy Explosive 2017 PK on everyone’s radar this year if you play basketball. Adidas does a great job of living up to the Crazy Explosive name. They were able to improve a platform that already works. The Adidas Crazy Explosive 2017 Primeknit made minor tweaks to the 2016 formula and the result is a better performing sneaker. The forged Primeknit upper provides adaptive support and ultralight comfort. The shoes also feature an anatomical lacing system that reduces pressure on the foot, mesh inserts for added airflow, and Boost that helps harness your raw energy. Cushion. The Adidas Crazy Explosive 2017 PK features full-length Boost cushioning that provides enhanced comfort, responsiveness, energy return, impact protection, and court feel. The midsole is wrapped by a lateral TPU roll cage for stability and supported by an infinity shank plate that acts like a spring. This setup provides added energy return for heightened control when taking off to the basket. Traction. The Adidas Crazy Explosive 2017 Primeknit has a grippy rubber outsole with a Coral-inspired traction pattern. The traction delivers commanding grip specifically designed for light footwork and explosive gameplay. This also allows 360-degree grip on all court types and conditions. Length and Width. The Adidas Crazy Explosive 2017 Primeknit fits true to size however it runs a little narrow. Wide-footers are advised going up half a size. Lockdown. The Adidas Crazy Explosive 2017 Primeknit features a one-piece bootie upper, internal heel counter, and an anatomical lace system. The sock-like fit of the bootie, support of the heel counter, and a fifth eyelet keep the heel in place. The wide lacing system wraps the entire foot and allows a more secure hold. 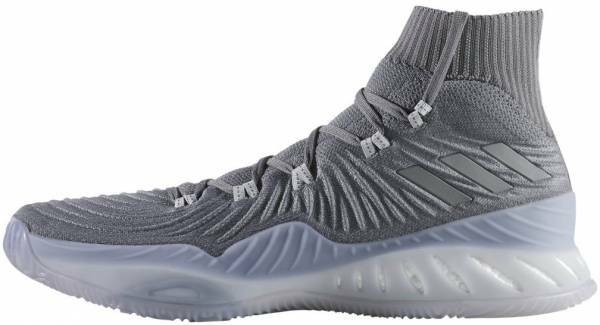 The Adidas Crazy Explosive 2017 Primeknit features a forged TPU yarn construction.This new forged Primeknit creates an elevated wave pattern across the upper, and it adds lightweight durability while maintaining flexibility. This build provides optimal stability for sharp moves while staying ultralight for quickness. The high-cut design of the sock-like ankle collar provides an adaptive fit without restricting ankle movement. This also completes the silhouette of the Adidas Crazy Explosive 2017 PK. This highly anticipated shoe has generated a lot of buzz thanks to its aggressive design, full-length Boost cushioning, and high-arching sock-like collar. There are several colorways to look out for, including a few player editions headlined by Andrew Wiggins of the Minnesota Timberwolves and Kristaps Porzingis of the New York Knicks. The Adidas Crazy Explosive 2017 Primeknit comes in mostly monochromatic hues. A few player edition colorways for the brand’s top stars were also sold by selected retailers. To kick off their summer championships in Las Vegas, Adidas launched a casino-themed Crazy Explosive. This carpet-inspired sneaker features a multicolored upper with gold accents. Completing the Vegas theme are card deck queens that are visible on each outsole.